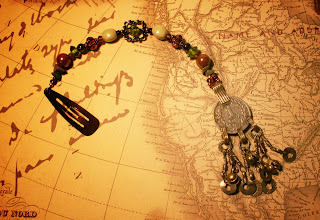 This is a close up of the item donated by Faire Trasures for Austin's Elysium Steampunk Ball on October 30, 2010. Great beads and metal work and the pefect pieces for any steamy pirate. Come out to Austin's Elysium Steampunk Ball on October 30th! Cover is $5 with costume and $7 without. Live music starts at 10pm and Costume Contest at midnight. Playing: Black Tape for a Blue Girl w/randal.holt:dead.cat.cello + DJ Void & Gothfather. 21+ Doors Open at 9:30pm. Steam Bath Factory and Christina & Co.